Thanks to Easy Earphones (YinYoo) for providing this free unit to review. So, here I am with my first KZ review in English. My previous experience with this brand wasn’t that happy (ZS3 and ES4, which I didn’t really appreciate). The first was too bassy, the second was too big and the sound – even if more balanced – wasn’t my cup of tea. Now I have the ZSN and the ZS7, and I can appreciate the progress of Knowledge Zenith. I wouldn’t expect this quality from a brand which didn’t surprise me in the past, at all. 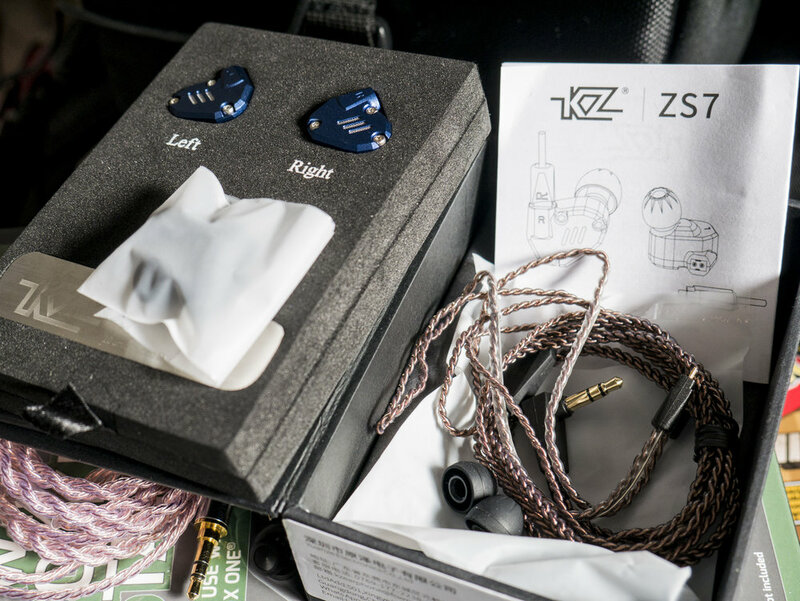 Like most of the people who want to start their IEM journey, KZ was one of the first brands which came to my ears. I was interested in trying the ZS6, but I changed my mind for the RevoNext QT2, a similar pair that I believed was superior. Since then, I hadn’t the opportunity to try the ZS6 nor to compare them, obviously, to the QT2; but I’m here now with the new model, the ZS7. The ZS7 share the same design as the ZS6, but the internals are the one you can find in the ZS10. So, even if this can make you confused, we are talking about a hybrid earphone, with 1 dynamic driver and 4 balanced armatures per ear. This is a similar configuration as the BGVP DMG, NiceHCK M6 (which I both reviewed here, in Italian) and the YinYoo D2B4 (yes, the “D2” name is a little tricky, but it may be actually a double diaphragm single dynamic driver). The fact is: the price of these multi-balanced hybrid earphones is actually really low. For 50$ on Amazon and even less on AliExpress, you can have a really solid model. 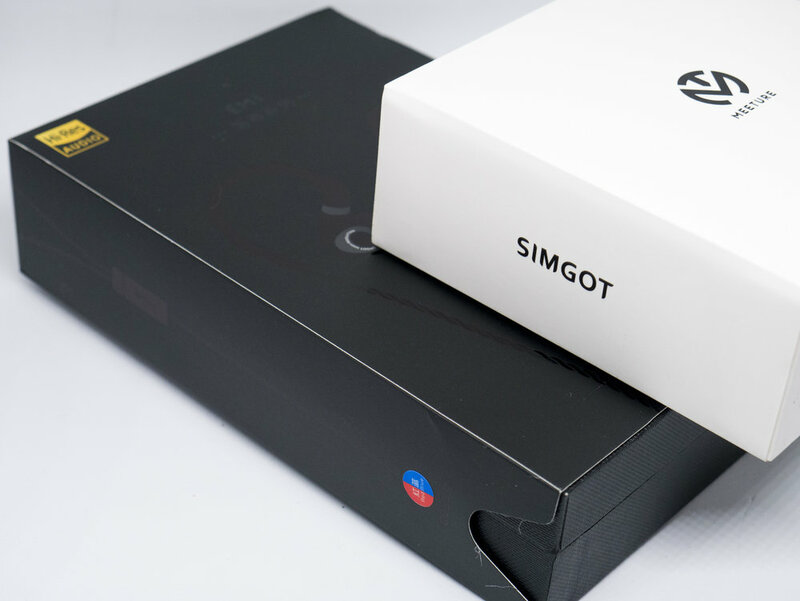 Starting from the box, which is an elegant black cardboard with a book-like opening. Inside you find the buds, in their amazing electric blue, and underneath the foam you find the manuals, the eartips (unfortunately, the classic KZ ones) and the cable – which is so bad that I didn’t even open it, because I know it and I hate it. Luckily, YinYoo sent over a cable by themselves, which is perfect for this situation (if you want, you can find my review of it in Italian here). 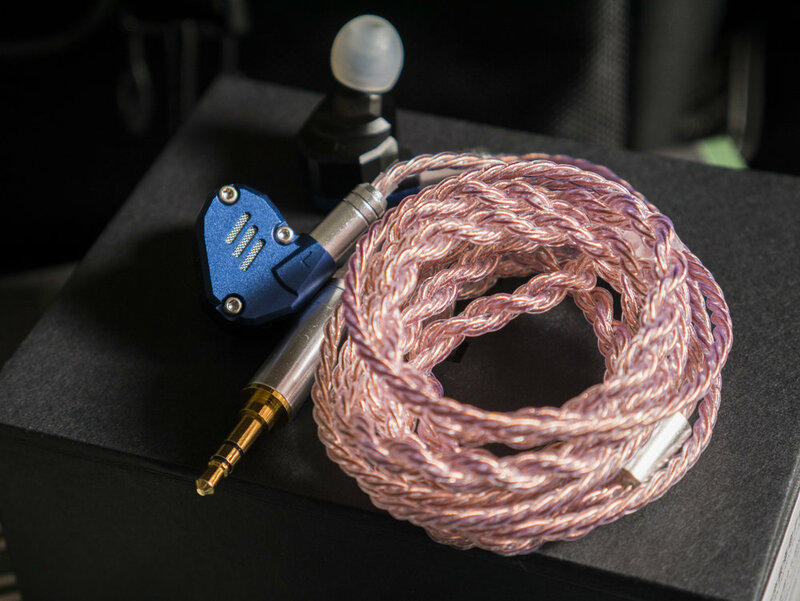 I have a color disease, but for me this coppery/pinkish color of the cable is a great match with the blue buds. The metal shell is really solid and very well assembled – I saw some macro photos before having my pair, and they looked kind of summarily assembled, but mine are actually well done. The back of the buds is black, but still metal; even the nozzle is made of aluminum. Because I put a cable which isn’t the stock one, I’ve also used some different eartips: I took the ones of the BGVP DM3, which I don’t use because they fall off my ears too easily. They are white too, which I prefer to the classic gray tips. The fit is strangely good, and not fatiguing. I can’t stand the QT2 which are similar, but these are better shaped, maybe. Considering my previous experience with KZ, I thought I would have found a disappointing sound. I didn’t. These are my favorite KZ among the ones I’ve tried, and also among all the earphones I have. I’m a design lover, a music lover, I pay attention to various things. 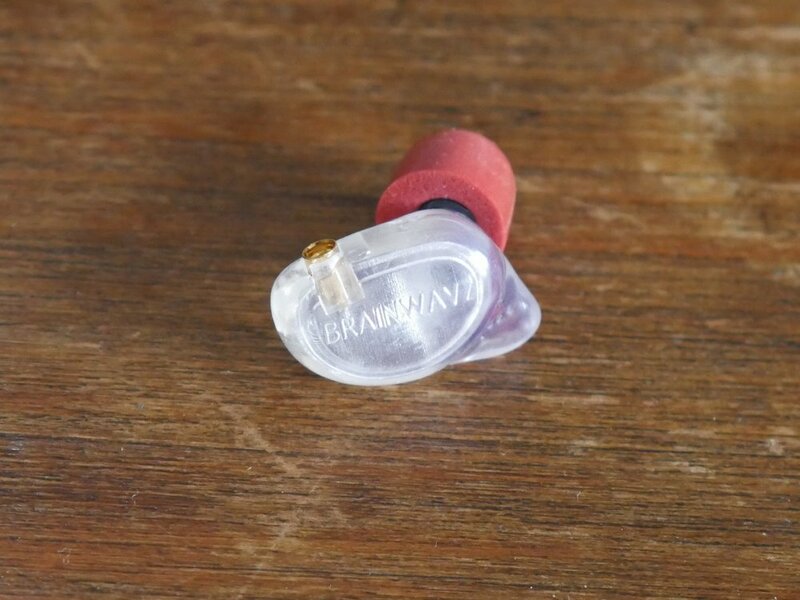 You can propose me the best sounding earbuds in the world, but if they are made of plastic, the fit is bad and they look ugly, I can’t appreciate them. Earphones are tools, but they are also jewelry nowadays. I can talk about them through the eyes (and ears) of mine as a musician or as an entire person with a lot of interest. 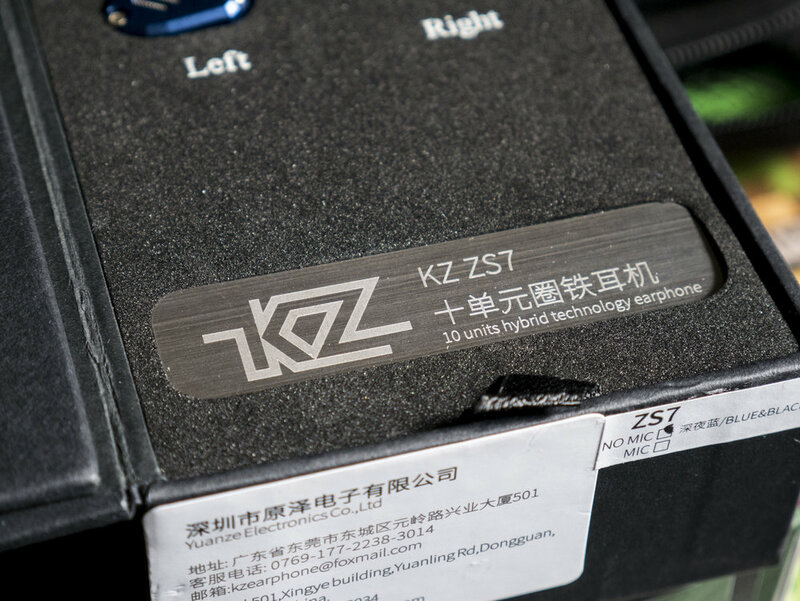 KZ ZS7 are good. Good-looking, at first. Good-sounding, at last. I don’t usually like this sound signature: everything is in its right place, until you hear an exaggerated enhancement in the mid-bass area. But this is actually good. Once you understand that you can’t monitor your recordings with them and you have to pair them with particular genres, the way is clear. They are fun, exactly the same way as they look. You can chill with them, you can relax with them. The sound doesn’t reflect the angular shape, though. It’s not sharp, not harsh, not sibilant. This may sound like heaven, for someone like me. It’s not heaven, but it’s absolutely an enjoyable place. Bass: not the best here. Sub-bass is lacking, mid-bass is emphasized. If I had to find the issue with these IEMs (apart from the cable), it would be this one. Once you get used to this, though, you appreciate the bump. Bassheads will be fairly pleased with this pair. I would rather have more speed and less oomph, because the mids may suffer from that. But I’m okay with the extension and I can survive with the emphasis. Mids are great. Even with the “invasion” that sometimes comes from the bass. I like voices, I like the space between the instruments, their layering. Maybe you can expect more detail by a set of four BA, but I don’t feel I miss any main focuses in my music. Vocals aren’t sibilant. This is something I’ve waited for since a long time, for a KZ earphone. I like everything of the sound, honestly, apart from that bass. Treble is smooth, not extreme but luckily not harsh. I enjoy it, and I’m not an easy person to satisfy when it comes to high frequencies. Even the highest voices are well controlled, and don’t miss any air or space. The soundstage is average. Not the widest, not the deepest. But the imaging is very precise, so you can enjoy your perceived little room and be happy. The intimacy is achieved. I wouldn’t call this stage “small” in a negative way. It actually opens up when the recordings are well done. But I’d call it intimate, because it’s very in-your-head sometimes, without being intrusive. And the mid-bass presence actually gives a very warm color to the signature which is really emotional. I have to say, I’ve wanted to like KZ since a long time, but it’s been hard, until now. ZS7 are a game changer for this brand. This is a very interesting moment: the price range is challenging and I have a lot of competitors. I’ll write some, but if you need others, write me on the comments or contact me anywhere. YinYoo V2: they are among my favorites IEMs. I still prefer them over the ZS7, because they come with better accessories (carrying case, better cable, better tips). Even the sound signature is suitable for more genres, because its bass is more controlled. I’d rather the ZS7 design. I say it now: it’s neary a 1:1 clone of the Campfire Audio Andromeda (and Polaris). I don’t appreciate brands which clone stuff, of every genre. They are even more similar to them than the RevoNext QT2. That said, I love the Andromeda design, so I cannot dislike the ZS7 that way. It’s not ethical, though. If I had to choose, I’d take the V2. ADVANCED Model 3: they are similarly tuned. But the mid-bass bump is more exaggerated on the Model 3 (strange to say!). I love the Model 3 because of their design, their accessories, their shape and their fit. That said, the ZS7 are better built and to my ears they are more finely equalized. OT, I’m curious to try the new models of ADVANCED, because they have the perfect shape for me, and a more similar driver configuration to these ZS7 (even though I continue to like the dynamic vibes). I’d choose the ZS7 between the twos (I’m talking about the wired version of the Model 3 in this comparison). RevoNext QT2: I like them, I don’t like them as much as the ZS7. They are very differently tuned, QT2 are on a reference side and they are bright, while the ZS7 are dark and fun. Same accessories here, so I can give you my preference: ZS7, because QT2 are too sibilant and I can’t stand that. And ZS7 are more comfortable. This time they did it: Knowledge Zenith is improving. I (more than) like the ZS7, and they are on my top list now. If they put a better cable instead of that crappy memory wire one, the improvement will be complete. And they could compete with the bigs. They just need a little bit of refinement in the tuning. But the ZS7 are solid, and I’m happy to recommend them.